Thanks to reports of growing U.S. production, WTI crude oil futures fell nearly 2% yesterday (March 22) to hit a 2017 low of $47.34. But that's no cause for panic. In fact, growing U.S. production is a reason to be even more bullish. The OPEC oil price deal is working, and it's injecting life back into the American oil industry. Despite this small blip, the OPEC deal has already boosted oil prices. And it's going to send prices even higher in 2017. Oil futures contracts are already trading nearly 30% higher since hitting their 10-year low in January 2016. And Money Morning Global Energy Strategist Dr. Kent Moors says oil prices could rise another 30% this year as long as OPEC's oil price agreement stays in place. Oil prices just hit their 2017 low this week because traders are afraid American crude production is undermining OPEC's oil cut. But even though OPEC has reinvigorated American production, that production growth isn't close to the size of OPEC's production cut. On Nov. 30, OPEC and 11 other countries agreed to cut their oil production by 1.8 million barrels a day, capping their combined production at 32.5 million barrels a day. Between the Nov. 30 signing and its start date on Jan. 1, the price of oil jumped 16%. While OPEC members are required to cut oil production, American producers are free to produce as much as they like. That means OPEC has American producers roaring back to life. Yesterday (March 21), the American Petroleum Institute reported crude oil inventories rose by 4.5 million barrels last week to 533.6 million barrels, an 11% increase since the start of the year. That comes after last week's EIA report that U.S. oil production is up 4% in 2017. And Friday's Baker Hughes Inc. (NYSE: BHI) rig count showed U.S. producers are still expanding. The U.S. rig count grew to 789 rigs, up 21 over the previous week. That jump in production has temporarily spooked the markets, but don't let it fool you. Since the OPEC oil deal started, U.S. oil producers have added 412,000 barrels of production a day, less than a quarter of the 1.8 million barrels a day OPEC is trying to cut. That's why this recent oil price drop is only temporary. 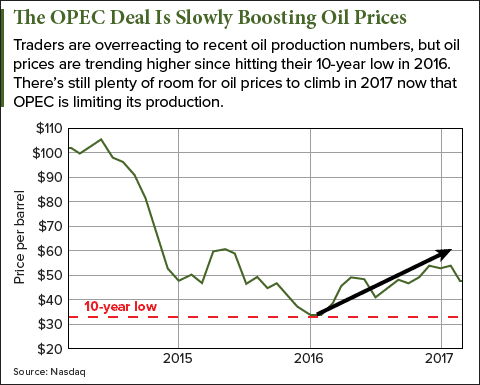 As Moors says, oil prices will keep rising as long as OPEC keeps the deal together. OPEC originally agreed to cut production to boost oil prices because its members rely on oil exports to fund their governments. That means OPEC members are willing to take a short-term hit on oil sales to get a higher return later on. They have a massive incentive to stick out this short-term pullback in prices. On Friday (March 17), OPEC announced a 106% compliance rate for its members. OPEC cut even more production than required by the agreement. And Khalid Al-Falih, Saudi Arabia's oil minister, told Bloomberg OPEC would extend its production cuts after the deal ends in June if oil inventories aren't reduced. Earlier this month (March 16), he told the CERAWeek conference that OPEC has a "strong willingness" to extend the production cut. The only problem for the deal is non-OPEC members, like Russia, who have lagged behind with a compliance rate of only 64% last month. But Russia also announced on Friday that it will reach 100% compliance – an oil production cut of 300,000 barrels a day – by the end of April. Those are strong signs OPEC is living up to its deal and will very likely extend it until 2018. That means American production will continue to grow in 2017 to capitalize on higher crude oil prices.